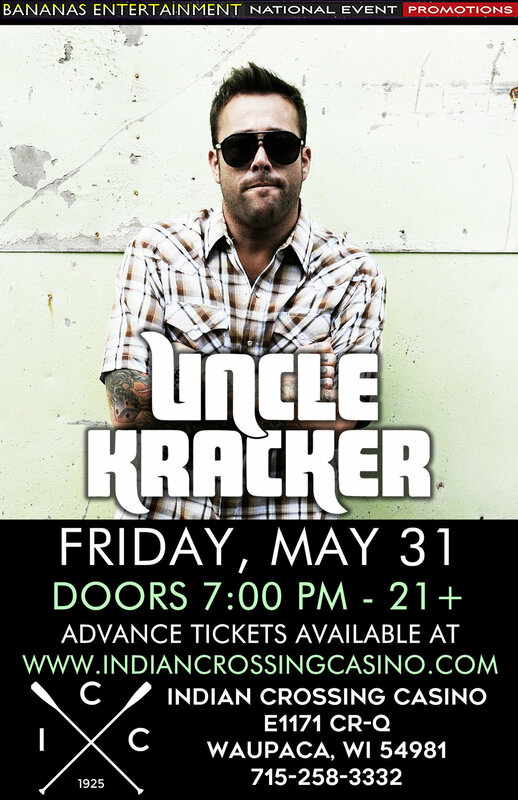 PLEASE SHARE - JUST ANNOUNCED - The Indian Crossing Casino welcomes Uncle Kracker LIVE May 31st!!! UK is an American singer-songwriter/musician known for his country and rock music. His 2000 major label debut, Double Wide, went double-platinum with #1 smash "Follow Me." Its 2002 follow-up, No Stranger To Shame, reached gold status with hits such as "In A Little While" & "Drift Away." Country superstar Kenny Chesney tapped him for "When The Sun Goes Down." Throughout, he has played sold out shows across the country. Advance tickets will go on sale this MONDAY (March 18th) at 10am.